(1 April 2019) We start a series on polytarp sails. The 15 April issue will continue the topic. Tom Burton had a flipping party so now his Philsboat sits upright on its trailer. The bottom is totally finished and painted and there should be no need for an anti-flipping party. It will be completed upright on its trailer. This is an old essay but I think it still applies. Now, let me say this was all written before David Grey started making sails at Polysails. His sails are made with different technology but they are very successful. There are more ways than one to do the job. There are limits I am sure to using polytarp for sails. For a polysail that sees regular use, some of it hard, it seems that maybe three years is a reasonable life span. I know of two that reached their end in about that time span. One flaked apart as polytarp will do. The other stretched out and lost its shape. It was recut and went back in use. 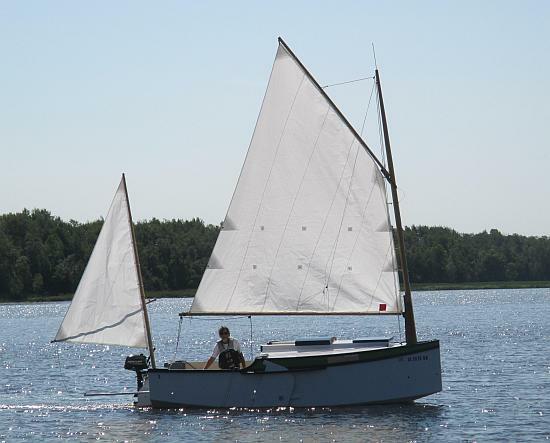 I can say with confidence that polytarp works well with an ordinary day sailer of up to 500 pounds max, but others have used polytarp on larger projects. 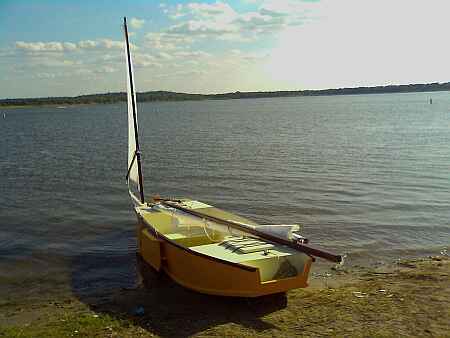 I made my first poly lugsail long ago. Before then I had used sails of real sailcloth sewing them with vertical panels according to pattern instructions in MAKE YOU OWN SAILS by Bowker and Budd. 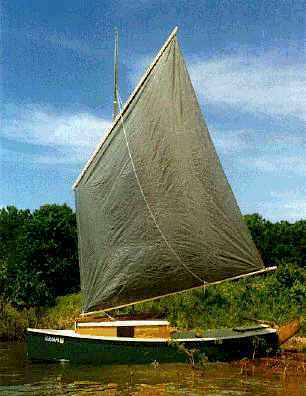 The first poly lugsail I made was a straight copy of the Bowker and Budd method. I cut the large one piece polytarp into 3' wide strips to simulate regular sailcloth and sewed it all back together using standard broadseams. (A broadseam is a seam of varying width which produces a draft "pocket" in a sail made from flat material.) For the next polysail I left the tarp in one piece, marked where the broadseams would normally be, slit the tarp at those locations, taped in an overlap of the slit pieces equivalent to the broadseam and sewed it all up with doublers over the slits. In my catalog of prototypes is an essay, originally written for Messing About In Boats long ago, that describes the method. At the same time we were learning how to strenghten the poly sail in the corners and perimeter to better take the loads of on the sail. Then Robert Smith's wife sewed up the polysail for his Cubit using the standard dressmaker's dart in lieu of the slit and doubled broadseams that I had been using. Much simpler and strong enough. Then I rethough making a lugsail from large polytarps, a way which really doesn't apply to real sailcloth. The picture shown above is of my Jinni in its last days. The sail is a 114 square foot lug made from a single poly panel and shaped with just two darts. There was really no trial and error involved with the new method because there is a way to size and shape the panel and darts before getting started. Look down at Figure 1 to get the basics of how it was done. Figures 1 and 2 are actually the details that I used to make a 70 square foot sail for my Piccup Pram, not the Jinni sail. What we have here is a three view drawing of a lugsail in xyz cooridinates. As you look at Figure 1 remember that points C and E stick out of the page enough to give the sail roughly a 10 % draft. That is to say if the sail were 100" long from luff to leach, it would bow out in an airfoil shape about 10". So in a way the sail shape shown would approximate a double wedge airfoil. It is a three dimensional figure. The idea is to imagine a shape that can be approximated by a bunch of triangles. Then imagine cutting along the edges of certain triangles such that the three dimensional pattern can be pressed flat. Then if you could reconstruct that cut pattern on a full sized piece of material and sew the cuts back together, you would have the three D figure again in full size. In order to establish the cut pattern, which is shown down in Figure 2, you need to define true flat pattern shapes of all those triangles. It's actually pretty easy to do. You need to calculate the true lengths of all the lines in Figure 1. Take the easiest one first, line AB. A is drawn more or less as the origin of the plan at point x=0, y=0. B is at point x=105, y=0. So the distance between the two is 105". Next take line AC. C is at point x=41, y=14, z=9. To caluculate the length of line AC you need to use the Pythogorean theorem that the sum of the squares of the sides of a right triangle is equal to the square of the length of the hypotenuse. So for line AC, the length of the x side is 41, the length of the y side is 14 and the length of the z side is 9. 41 squared is 1681. 14 squared is 196. 9 squared is 81. Those squares add up to 1776. The square root of 1776 is 42.14 and that is the true length of line AC. You can program your computer to do this sort of work with any spreadsheet program but. to tell you the truth, a scientific hand calculator and pencil and paper are about as fast. You make out a table of the true lengths of all the lines in Figure 1. Look again at Figure 2. You need to find a way to slit the 3D sail pattern along certain lines that will allow it to press flat. In the example I have slit it along AC and DE. I think it also could have been slit along BC and FE, or AC and FE, or BC and DE. But you see the effect. To lay out the pattern full sized on a sheet of polytarp, first unfold the polytarp and spread it out as flat as possible. That may not be easy. Stretch it and weigh it down. One problem with polytarp is that it is usually difficult to impossible to get it to lay truely flat without creases. The flatter you get it the better. The general idea is to lay out the pattern in such a way that no edge line comes within say 4" of the edge of the tarp. That way you will have some material along the edge lines to allow for spar bending and for sewing hems. For this Piccup sail, I would start by laying out line AB. I use a steel measuring tape with its end at point A secured by a weight and stretched to B. Point B is marked well using a waterproof felt tip marker. Then I stretch a chalk line from A to B and snap a straight line. Next I use two steel tapes, one swung from point A and the other from point B to establish point C on the polytarp. The lengths used on the tapes while establishing point C are the true lengths AC and BC that were previously calculated. To get it right the measuring must be done with good accuracy. Then point C is marked with the felt tipped marker and lines AC and BC are snapped with the chalk line. So we have established the true shape of triangle ABC on the tarp. We repeat the process to establish all the triangles in full size true shape. For example the next triangle would be BCE using BC of the first triangle as a starting point. When done we will have all the points of Figure 2 marked in felt tip pen and all the straight lines marked in chalk. Next we mark the lines that will make up the real edges of the sail. Here we will adjust the straight lines for extra round required for spar bending and in the case of the leach, some hollow to prevent fluttering. I'm quite certain the luff is best left straight. So to mark these you will need a flexible battern long enough to span the points in question. For the leach you would anchor the batten at points B and F, push the batten center inward about 2" and mark with a felt pen. The rounds required for spar bending might vary quite a bit. For the Piccup I guessed the spars would flex outward about an inch in normal service. So for the head of the sail, for example, the batten is anchored at points F and D2, pushed outward an inch, and marked with the felt tip marker. The lines AC and DE have been opened up, of course. So they now look like "V's" instead of a straight line. So I've shown two points as A2 and D2 to define the openings. There are shown at those points "gaps" of 5.2" and 1". But don't cut the pattern at those gaps. Instead cut straight across from A to A2 and from D to D2. We will close those gaps while sewing up the sail with a traditional sewing "dart" as opposed to cutting them along the edges and rejoining them somehow. If you've read essays on real sail cloth you might ask "Where is the round for the sail draft?" Good question. I've only shown round for the bending of the spars. The answer is that the pattern shown in Figure 2 has by nature extra material in it to allow for the "draft round" of traditional sail making. When the "gaps" are sewn shut you see that the pattern actually has the extra draft round material sewn in. On the Piccup pattern shown in Figure 2 I carried the pattern a few steps beyond what I have described above. By using the true lengths of the triangles I was able to define all the points in XY coordinates with my computer, in short I was able to do the flat pattern lay out on paper. But there would have been no accurate way to lay out the pattern that way on the polytarp. So I took it another step and redefined the location of the flat pattern points as radii swung off points A and B. And those radii are shown in the table in the upper right of Figure 2. The idea was to stretch out the tarp, establish line AB, pivot one steel tape at point A and another at point B and then draw all the points by swinging the radii shown from just those two points. And laying out the sail took but a few minutes. Alas, figuring out the inersection points and radii took forever. I've never tried making a triangular poly sail although others have done so. What is interesting about the method shown above is that it appears that an effective way of shaping a triangular sail made of one sheet poly would be with a single seam from the tack, more or less the equal of seam AC on the above sail. I'll show the details of sewing up a poly lug sail. 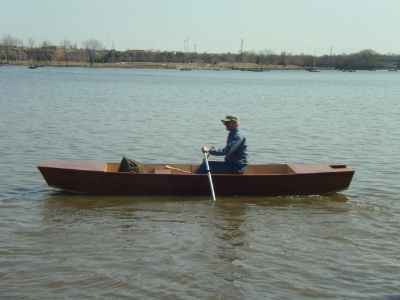 He sent me some photos of a paddlejon he had seen recently and a sales brochure. I tried to copy the lines, thinking all the time that these boats are a lot more subtle than you might think. 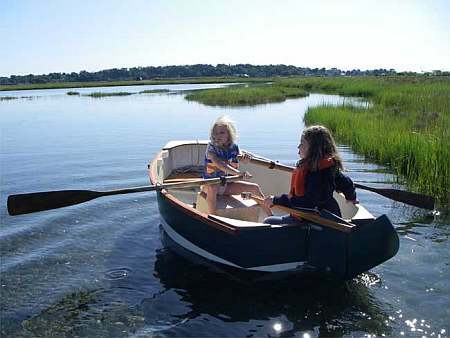 At the time I had no real Lowe around to study but the brochure left me with the impression that the paddlejon was perhaps a regular small power jon made long and double ended with swept up lines both fore and aft to allow easier paddling. But it is not quite a true double ender in that the stern transom is raked for the usual 15 degree motor mount. As far as power goes, a boat like this won't plane nicely at all, trying to stand on its stern at the least excuse, so I say 3 hp max. Getting back to the lines, I had the feeling that these are made from a constant width piece of aluminum, say 32" wide on the bottom and 16" wide for each side for a total panel width of about 64". Stiffening wales are already pressed into the panel. The flat wide panels are folded with a brake such that the proper flare of the sides is established. The end chines are notched and the end bottoms drawn up and the end sides are drawn in to close the notches which are then welded shut. But the chines for the main portion of the hull are not welded at all, just bent. There seems to be another trick in that the top of the sides bends inward a lot sooner than does the bottom of the sides, resulting in a rolling flare that gives the boat a somewhat elegant shape (I think). 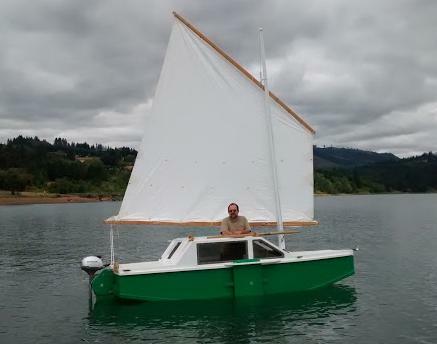 So you might think a manufactured jonboat is a dumb and brutish thing, but I'm quite certain most of them are actually pretty clever. Jim Hauer built the prototype in Green Bay and sent these photos. I think it came out exactly as hoped. 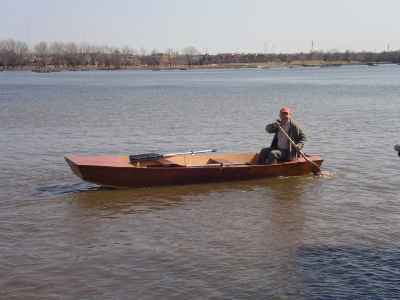 Remember, this is not really a rowing boat as much as a floating boat so the face forward rowing will be used more to steer than to propel. The photo of the man paddling in the stern shows that the aft transom is still up giving good flow lines there, unlike a square stern power jonboat. Under power Jim said that 2.5 hp is about all you can take, the boat not behaving well above that. 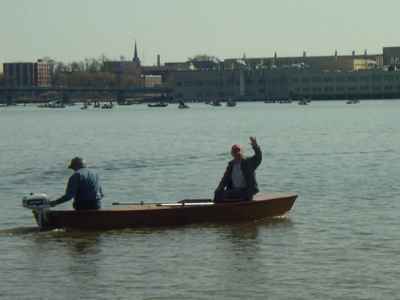 Anyway, River Runner uses five sheets of 1/4" plywood. 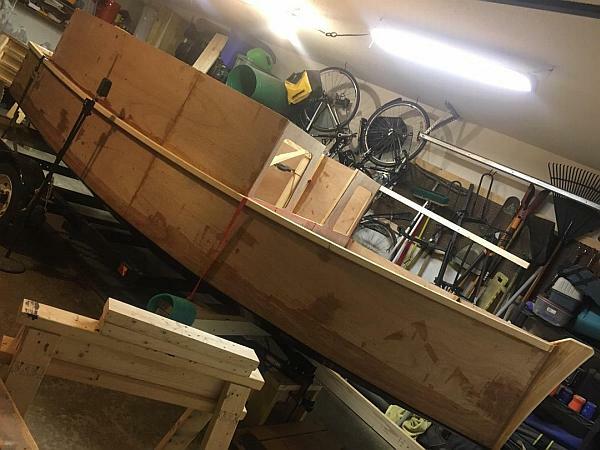 The idea of the light ply is to keep the boat light enough to manhandle into a truck or onto a car roof but it will take a diligent builder to keep it light. I suspect the aluminum original would be no heavier. Simple nail and glue construction. River Runner plans are $20 when ordered direct by mail from me.